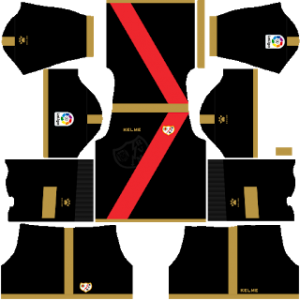 In this article, you can find and download Dream League Soccer (DLS) Rayo Vallecano Kits and Logos 2018, 2019 Edition with URLs. Rayo Vallecano is a professional Spanish football team based in Madrid. The club was founded on 29 May 1924. Currently, the team is competing in the La Liga following their promotion from Division B. Los Franjirrojos is the second most common word used for the team from Madrid. Rayo Vallecano play its home matches at the Campo de Fútbol de Vallecas. It has a capacity of 14,708 to withstand. In Dream League Soccer you can change the kits and logos of your team. In order to do that you will need the URL of the kits to download. So in this post, we are providing the Dream League Soccer Rayo Vallecano kits and logo to download and play. The kits and logo are in the size of 512×512. You can use this kits in DLS by clicking the URL to download the Rayo Vallecano team home kit 2018-2019. 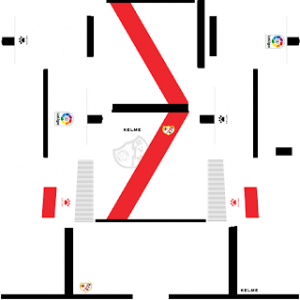 You can use this kits in DLS by clicking the URL to download the Rayo Vallecano team away kit 2018-2019. You can use this kits in DLS by clicking the URL to download the Rayo Vallecano team Goalkeeper’s home kit 2018-2019. 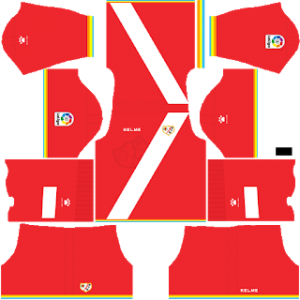 You can use this kits in DLS by clicking the URL to download the Rayo Vallecano team Goalkeeper’s away kit 2018-2019. You can use this Logo in DLS by clicking the URL to download Rayo Vallecano Logo 2018 – 2019.